There’s some talk on the net at the moment about honesty being the best policy and people being paid huge sums of money (oh, I wish!) to say great things about Apple…..so I’m ‘fessing up straight off. The wonderful people at Renaissance kindly gave me a copy of Tiger to install. And yes, I can be bought that easily…and I will keep saying that they are a great bunch of people. I’ve installed Tiger on my G4 iBook and also have received a copy at work (via Uni licensing) and put it on my office dual 800Mhz processor G4. I’m a fan of complete clean installs these days, so thanks to a wireless card in the iBook I’ve copied over all my important stuff to my iMac at home before I did the laptop install. My first grizzle is one with all software. Why the heck do we need a big box for such a small item? I’m not going to be upset when I pay for a piece of software if it arrives in small packaging! I’m not a greeny or anything, but I have never understood the logic of it. Great things can come in small packages! The software came with the usual guff….software license agreement, instructions on how to install, support guide…as well as a few other goodies….a trial of iWorks on CD (clever I thought but I’m not going for it) and a glossy book on Tiger. Missing this time I noticed were Apple stickers which was quite shocking (they’re almost like comfort stickers as they’re always there for you) and the install DVD. Yep…DVD….this baby comes on a DVD not CDs, although you can arrange to have that disk swapped for CDs. The packaging does state that a DVD is inside the box, but interestingly, the list of requirements printed concerning the specifications of the computer you need, fails to make any mention of needing a DVD drive. Installation took around 25 minutes and first impressions are that not a lot has changed. Yes, sure, there’d a spotlight icon and access to new things like the Dashboard, but first impressions are that OS X still looks like OS X. That might sound s bit of a silly comment but I think part of means that Apple have refined the interface to a point that we are all comfortable with it. Unlike a previous update that introduced substantial new ways to get around, most of the changes you see are minor or subtle….and some annoying. I’ve suddenly got noises happening as I drag a file onto the desktop, so I need to find how to change that quickly! (the sound control panel was the answer). I’ve been using Tiger at work now for about a week and I have to say that I really don’t feel like much has changed even when I know it has. I’m not putting Tiger down…it’s running great, but I’m not doing anything at the moment that seriously pushes the machine or is overwhelmingly different to the way I normally work. I’m sure those pushing their machine or on a high powered machine will find the talk about speed improvements more noticeable. I suspect that as get to use Tiger more, I’m going to experience new aspects of it that cause me to go "Oh" rather than "Wow". Take spotlight for example. It’s a superb tool to use and a stunningly simple concept. To Apple’s credit it just seems second nature to use, but I’m not bowled over by it…it just seems a natural part of the OS. Perhaps I shouldn’t be so nonchalant? Some of the changes are interesting. System preferences have more obvious options in areas such as the network panel etc., but the system prefs as a whole have been slightly redesigned and now feature a "Show all" button at the top of the window rather than a set of icon of various control panels. 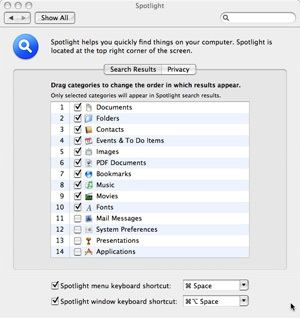 When you use spotlight, you can go to the spotlight control panel and make adjustments such as switching of applications that are indexed (I switched off Mail searching for example as I still don’t like Apple’s Mail). One thing that will impress you will be the speed at which your disks are searched. One surprise that got me also was when i first plugged my new iPod shuffle in. About the same time I went up to spotlight and saw it was immediately indexing the iPod. Dashboard is at this stage a bit of a novelty. Konfabulator never appealed to me but I suspect that gradually Dashboard will take hold and I’ll be hooked. I’m already starting to look at things like the Version Tracker widgets and checking a few sites on a regular basis to see if new widgets are out. People are also starting to talk about ways to have dashboard widgets permanently on their desktops. 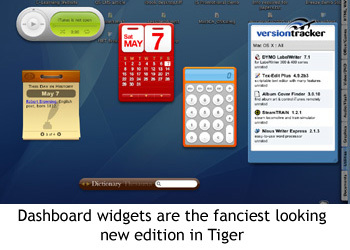 Two things that do surprise me (considering Tiger had a wide test base) is the number of widgets available (only 90 at this point) and the fact that already, there’s some obvious improvements that could be made in how you use them. Going to the multimedia side of things, Tiger comes with QuickTime 7 and iChatAV,which both make use of the new H.264 video. However, despite the new quality being amazing, you’re going to need a grunty Mac to see the video in smooth playback. With iChat AV, it was only near the launch day of Tiger that we learnt that for a 4 person video conference (for example) you’re going to need a Dual 1 GHz G4, any G5 Mac. The QuickTime Pro pricing issue annoys the hell out of me. Having paid for a full Pro license for QT 5 and then QT 6, why the heck can’t Apple have the decency to bring in an upgrade price for existing Pro owners? The Ars Technica article suggests doing away with the Pro pricing idea with QuickTime. I can’t see that happening, but why couldn’t Apple just say $29.99 for QT 7 but only $14.99 if you’ve already got QT 6 Pro. I think it stinks to be honest. The interesting thing is that I would interpret it that I now have licenses for each of those QT versions…5, 6 and 7….so therefore I could legally sell my QT 6 Pro license to someone else could I not? I mean it is a full and complete individual license for something! Come on Apple, stop using the term "Upgrade" when talking about going from QT 7 to QT 7 Pro and start giving us true upgrade paths from one version of an application to another. The slight changes in look for Tiger has received a lot of press. I’d describe it as a subtle aqua or a flat aqua. What once was glossy, rounded and three dimensional in look is now flatter, almost pastel (but not really) and less intrusive. However many are not finding such changes that pleasant and Mail is receiving the most flak, with people already releasing patches to change its look back to how it used to be. I like the quiet and unspoken features that do make you go "Oh, that’s nice". Safari now not only reports no network via the browser when you try to view a website and there is no connection…it also provides a button in the warning page that will take you to the network settings control panel. At the same time, a very simple but welcome touch to the dialogue box that appears when a program crashes is to give you the option to open it again. Kinda makes sense, doesn’t it? 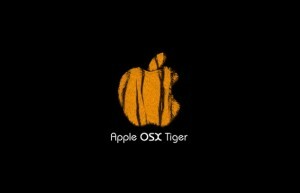 Most of the things I’ve written about are just my experience in using tiger since its launch. There are many more in-depth and detailed reviews of Tiger out there (Ars Technica again is a superb review) which pull the OS apart far more than I ever could. I’m enjoying using Tiger and finding it very stable and easy to use. The fact that Apple talks about 200 changes that are in the OS and that some of these changes are fairly trivial, masks the fact that in fact under the hood, quite a bit new has happened. My prediction is that over the next few months, we’ll see applications come out that take greater advantage of the new operating system and technologies such as Core Audio and Core Image that will make us really start all talking about the OS. I almost feel as though we’re back in the days of 10.1 coming out. We all knew there were changes and many of them were interface changes that helped with using the computer. But then neat programs started appearing that took advantage of the technologies. Apple Roadshows saw witness to demos that said "Bet you didn’t know you could do this" and I think we’re all just starting to say that about Tiger. Safari RSS is one of those surprises for me. I shouldn’t have been surprised, but I just handn’t read enough to know what was coming. Safari now picks up RSS feeds on your site (or you may have to add a little snippet of additional code as I have done on this site) and will display an RSS icon in the browser. Click on this and you’ll see the RSS feed that the button is linked to, diplayed superbly in a way that is just a joy to use. Well done Apple! And perhaps that’s a good thing also. Apple has signalled that new versions of the operating system are not going to come as fast as they did before. Tiger makes you feel settled and not lacking for applications or ways to world. 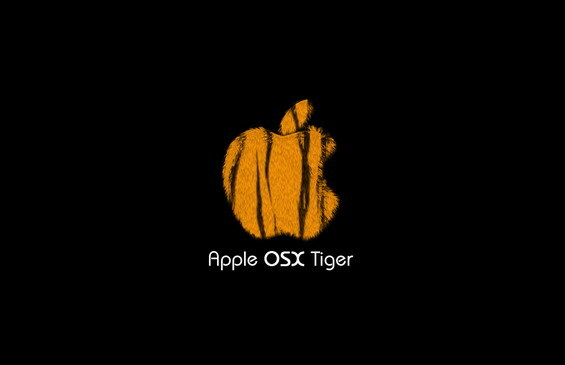 In that respect, if I have to wait a while for a new OS, I’m quite comfortable waiting in the company of Tiger. My next mission is to get stuck in to Automator. I’m yet to even try it, but I know there is going to be a lot of uses for it. Renato contacted me from Portugal about "Get Info" and my comment about it "going back to the old days". 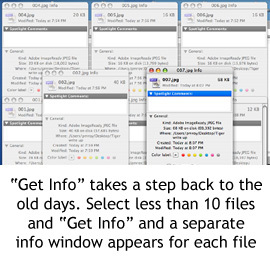 My comment was about the fact that individual information windows open for each of the files when you select less then 10 files….like it used to in Mac OS 9. It was not intended to imply that Tiger was a step back. Renato provides a couple of great tips for when working with files.